[242 Pages Report] The helicopters market is estimated to be valued at USD 26.26 Billion in 2016 and is projected to reach USD 30.69 Billion by 2022, at a CAGR of 2.65% during the forecast period. The base year considered for the study is 2016 and the forecast period is from 2017 to 2022. 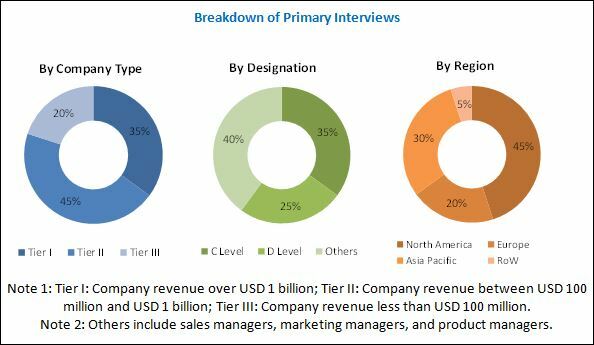 The objective of this study is to analyze the helicopters market, along with statistics, from 2017 to 2022, and to define, describe, and forecast the market and map the segments and subsegments across major regions, namely, North America, Europe, Asia Pacific, and RoW. The report segments the market and forecasts its size on the basis of end-use, type, application, components & systems, and aftermarket components & systems. It provides in-depth market intelligence regarding market dynamics and major factors, such as drivers, restraints, opportunities, and industry-specific challenges influencing the growth of the market, along with analyzing micromarkets with respect to individual growth trends, prospects, and their contribution to the market. The report also covers competitive developments, such as long-term supply contracts, business agreements, joint ventures, mergers, new product/technology launches & developments, and research & development activities in the helicopters market, in addition to the business and corporate strategies adopted by key market players. 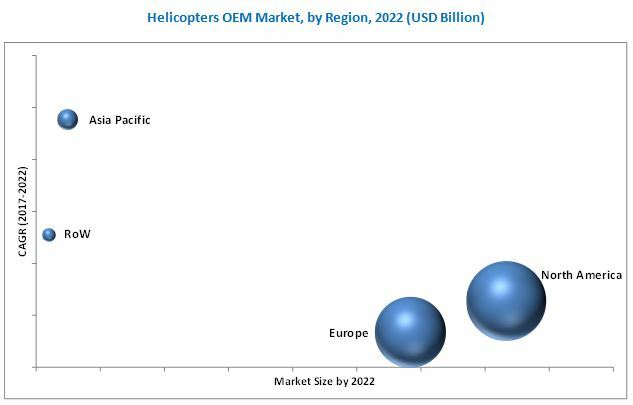 The ecosystem of the helicopters market comprises manufacturers, component and system suppliers, aftermarket operators, and technology support providers. Airbus Helicopters Inc. (France), Bell Helicopters Textron Inc. (US), Russian Helicopters, JSC (Russia), Leonardo S.p.A. (Italy), Lockheed Martin Corporation - Sikorsky (US), Kawasaki Heavy industries, Ltd. (Japan), Columbia Helicopters (US), and Boeing (US) are some of the established market players. These leading players offer advanced technology systems, products, and services in the market. They also provide a broad range of engineering, technical support, aftermarket, refurbishment, and information service capabilities in the market. The helicopters market is estimated to be USD 26.93 Billion in 2017 and is projected to reach USD 30.69 Billion by 2022, at a CAGR of 2.65% from 2017 to 2022. Increasing demand for EMS (emergency medical services) in regions, such as North America, Asia Pacific, the Middle East, and Africa and the growing demand for military helicopters due to replacement as well as capability expansion programs worldwide are factors expected to drive the market during the forecast period. The global helicopters market is expected to witness positive growth, especially in emerging economies, such as China, Brazil, and India. These countries are spending a huge amount on the development of their civil and military helicopter fleet. The economy of these countries has also been witnessing significant growth over the past few years. The increasing demand for helicopters in emerging economies will, in turn, drive the market during the forecast period. Territorial disputes in Asia have also compelled governments of the region to increase their defense spending. This increased defense spending is expected to positively reflect on the procurement of military helicopters, especially in China and India. Companies operating in the helicopters market are focusing on acquiring business contracts. This strategy was adopted by key players to enhance their market penetration and increase their service offerings in the market globally. Key players profiled in the helicopters market report include Airbus Helicopters Inc. (US), Bell Helicopters Textron Inc. (US), Russian Helicopters, JSC (Russia), Leonardo S.p.A. (Italy), Lockheed Martin Corporation - Sikorsky (US), Kawasaki Heavy industries, Ltd. (Japan), Columbia Helicopters (US), and Boeing (US), among others. These leading players offer products and services and provide a broad range of aftermarket, engineering, refurbishment, technical support, and information services. 15.2 Bell Helicopter Textron Inc.
15.7 Kawasaki Heavy Industries, Ltd.
15.9 Korea Aerospace Industries, Ltd.
15.12 Turkish Aerospace Industries, Inc.